Gyumri Development Forum aimed at boosting collaboration among different stakeholders to contribute to the city’s revitalization and growth was held on December 8. 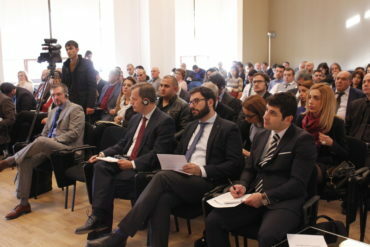 The Forum was organized by Asian Development Bank’s Armenia Resident Mission in conjunction with the IDeA Foundation and Gyumri Project Hope Foundation. The event brought together national government representatives, local authorities, international and local experts in development, civil society and international organizations, and other stakeholders, to discuss economic, social and business development in the city and to seek solutions for speeding up infrastructure upgrades. The ADB is supporting Armenia’s efforts to improve its major cities, including Gyumri, by upgrading road and transport infrastructure. As a stakeholder for infrastructure and tourism development, education and country brand promotion, IDeA Foundation is partnering with ADB. Gyumri Project Hope Foundation is currently developing a master plan for the city’s revival over the next decade.